William steps up quietly upon his soapbox. I recently surveyed several 'pirate festivals' by perusing pictures and videos from as many as seven different events. The videos were typical of most pirate gatherings, featuring everything from duels to dancing, parades, small arms fire, and not a little drinking. Out of hundreds of photos and nearly thirty minutes of combined video, I found that I was bothered on some level by the complete lack of presentation when it comes to the most basic aspect of piracy. Do I see pirates? Yes. Some more obvious than others. Caricatures, certainly. Do I see sailors? Almost never. I bring this up only because of my most common pet peeve about kit. Sailor's knives. I almost never see sailor's knives. I almost never see knives period. I went through hundred of pictures over the last few weeks and saw enough pistols to arm two fair sized ships but not enough knives to man one quarter of a watch at work. I counted 60+ pirates at one event by thumbing through pics of the gathering and found only one pirate carrying the most common tool, weapon and eating utensil known to the common sailor…a knife. What's worse. I've even found 'pirates' reluctant to add one to their kit, NOT because of safety rules or festival restrictions, but because they simply don't see the need. Indeed, one pirate I spoke with argued that a knife is pointless or unnecessary for kit if you're armed with a good cutlass or rapier. I found another man carrying eight pistols and no knife. Eight pistols and a blunderbuss, but no knife. Eight pistols, a blunderbuss and a rapier, but no knife. I'd like to meet the captain that would let a man aboard with eight pistols and no working knife. Knives are a tool and the tool. Knives are defense and offense. A good knife can be the difference between life and death. Ask a friend of mine who once saved his coworker in the Bering Sea through the swift, simple act of cutting a line in an instant. You can also learn a lot about a person from a knife. While encamped at Fort Taylor in November I asked a fellow pirate for his knife, which he gave over proudly. I turned it over in my hand and tested the edge and learned several things about the man. First, I learned that he keeps his tools in working order, demonstrating something about the man's attitude toward work and the value of maintenance. Second, I learned that he was right handed, not only because of the way he handed me the knife, but because of the wear on one side of the blade. Third, he drew it out so quickly when asked that I now know that he carries one on his person most of the time, so it's a genuine working knife and extension of him as a sailor. I also learned that he favors a short knife without a point and free of frills or decoration. The knife told me something about the 'sailor' in the pirate. If I could change only one thing about the hobby I would have every pirate carry a working sailor's knife. William steps down from his soapbox to whittle. While William has a valid point, my concern is with historical reenactors. When it comes to ren-faire, hollywood, fantasy, i'm enjoying myself my way pirate, to each his own and enjoy yourself. please disregard as this reply is not directed towards you. HUZZAH! I've looked at some of my living history pics and you can see my belt and knife lanyard, but the sheath and knife are always tucked under something- bummer. It never ceases to amaze me at the number of historical reenactors that come up and need to borrow a knife to cut a piece of line or halve a fruit of some sort. I've argued this for a long time as well and have given up. As a positive side, this probably helps keep festival injures down. edit* this argument can also apply to being able to tie proper working knots. "I'm a pirate", ok- tie a knot, "ummmmm- i'm the captain of <insert choice here> thats what the cabin boy does-arggggg"
My knife was out of reach once (I had left it sheathed to the strap of my haversack), so I asked for a blade and three knifes were presented almost at once, including a French trade knife, a short knife with a blunted tip and a Spanish folder. This has happened on at least five different occasions and I sometimes ask for knife just to see what the crew is carrying at the moment. I am never without at least one blade unless I have to be in a Gov't. building for some reason. I understand the need for sheep-footing a blade if you work in the rigging too, but I don't own a proper seamans knife in that respect. I am currently looking at forging my first period folding knife. This is the one answer to all the problems with knives at events. Folders don't fall out of sheaths or poke through and present safety issues, and we almost always have a pocket or a bag to keep one tucked away in. My take on the matter FWIW. Carried a belt knife and folder both days at the Marathon Fest. Belt knife was a Russell Green River straight blade that sits low in the sheath so its later pc is not obvious. One of the things I am always after is a good period reference to a sailors knife. Has anyone got any pictures of any? Not a modern reproduction of one, I am talking about an actual period example or drawing? I have managed to find a picture of a dutch sailors/fishermans knife that looks like it fits the image of the one worn in the picture I posted last year (in the earring thread as i remember). It was recovered from an early 18th century fishing vessel that sank off the dutch coast. Hopefully the next time i am in my fathers workshop I can replicate it as it bugs me too not having a working knife (although here in the UK our knife laws are as strict as our gun laws so it'd have to be blunt). Yeah! My everyday-knife is a Russel Green River "Ripper" blade blank modified to my liking with coffin shaped padauk slabs, brass pins, and my own sheath. It goes everywhere with me all day long. All us White-Trash members have one and finished them ourselves, it's a "trade-mark" of being a member. We call them "white-trash skin doo's"
I did find a riggers knife I forgot I had just a little while ago cleaning out my old gear bags. I has a sheep-foot type blade and a marlinspike. It is a Japanese made modern sailors knife with cheap black plastic handles, but I may try to modify it to some antler scales or wood of some sort. 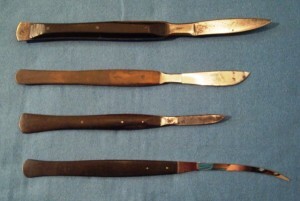 As tp period examples of sailors knives, i don't know if I 've evre seen one. The wreck of the LaBelle in 1687 had some metal folders on board, but I don't think they were spcifically sailors knives as much as they were for trade. yeah I keep hoping they will put one out of the La Belle, Whydah or Queen Annes Revenge but I havent seen them mention one yet. This topic and the topic just labeled "Sailors Knife" has me pondering, what IS a sailors knife? Is it a particular style of knife? Does it have a long or short blade? Is the blade thick or thin? Does it have a specific purpose or for general use? I ask because I usually have a knife, and at one event (Deltaville) I was going to help cut and splice some lines with Pern and CJ(I can't remember) anyways, I pulled out my knife and was going to cut a line where directed and was shown a different method. That method was holding the knife on the line and then hammering it through the line. Except my blade is relatively thin and I could tell wasn't designed for that kind of work. Then Pern and the other fellow, showed me the knives they use. They called them "Riggers knives". It had a much wider top edge and thicker blade to withstand being hammered on. So, Is a Riggers knife a "sailors" knife or is that more a specialty blade for a specific purpose and a "sailor's" knife is something more for general purpose work? a riggers knife is a completely utilitarianly different tool. I have no idea how far back they go. the knife is as chaos described plus the blade is actually a flat thickness and is sharpened like a chisel- only on one side. It is ONLY used on cordage. Unfortunately, Pern has a really beefy sailors knife (don't tell him that). its blade it tapered and sharpened on both sides. I've seen modern ones made from a filed down leaf spring. All they are is straight stock with a handle shaped out and an edge put on. The handle then has leather wrapped tightly around it to absorb the shock of blows. As far as a sailors knife goes, a small patch knife with pointed tip (maybe 6 inches total length) was found buried with one of the bodies in Jamestown hanging around his neck. Actually, the cord was rotted, but it was positioned to hang around his neck and thats where the scraps were headed. The archaeologist said it had lots of use before it was buried. It is safe to assume it came with him as there were no iron works. A sailors will that has come down through my family from 1647 identifies a fyshing knyfe and shyps knyfe, but do not describe them. So they had specific items it seems. Even when portraying an officer, I still have my knife on me. (Albeit hidden in my skirts) Far to useful of a tool not too. This early 18th century, museum-quality sailor's knife has a fine ivory handle with silver pique dots and a fine mellow patina. The blade is 6 1/2" and is engraved on one side with a fine Makers Mark present. Comes with original wooden, vellum-covered sheath. What do people think? Is this what it says it is? was it made by a sailor? sure if they say so. is it museum quality? I'm not a curator, but if thats how its graded. Is it a knife a sailor used? now thats what i'd like to know. If its museum quality i doubt it was. It may have been decorated and parts of it made by a sailor to while away down time. I wish there was more back story to describe it. It's a pretty shape and look. I bet its comfortable in the hand. The blade looks like a curved blubber knife. I wonder if its a whaler era. I almost posted that very knife, but I've seen it listed as a late 1800s and early 1700s knife, so I'm not confident about the date to consider it. Most knives I've seen carried about at festivals tend to mirror shorter trade knives or rigging knives of the period. the trade knife styles I've seen reenactors use often have a hole added for a lanyard. This thread on bladeforums shows an interesting blade of 1715. I would think that any knife COULD be a sailors knifeas long as it rides comfortably comes to hand quickly and is capable of holding a razors edge is a sailors knife especialy a pirate's. That being said I carry a opinel carbon steel folder in my waistcoat pocket at all itmes at events. I also carry a "hammer knife" when I am demonstrating rope work in my working attire. Whem dressed in my finery I carry a windlass steel craft "sailors knie" in my sash. Around my neck usualy hangs a sheeps foot blade that a friend made for me. All of the afore mentioned knives meet my personal standard for a sailors knife. So even if you do not see them they are always close at hand. I've seen him strike the hammer knife a time or two, and Bo'sun Carl is a good example of a man with a knife for all occasions. I've seen sailors carrying English and French trade knives, Weidbesteck knives, belt knives, Eustache knives, Spanish folders, Sheepsfoot knives, razors and hunting knives. I'm less about questioning the type of knife as much as the presence of the knife. Bo carries one that I've vowed to take off his cooling corpse when he dies. As amiable as he is, I'm stealing it if he doesn't die soon. Whenever I'm doing pirate I'm wearing a rigging knife and marlin spike with a hemp lanyard I braided connecting them. But, I wear them on my belt under my waistcoat so they are not obvious. My kind of daily-wear knives. I'll post period examples as I find them. This is a French clasp knife called a jambette, circa 1700. The jambette is what I am considering making, only mine will have the sheepfoot blade type with a heavy spine for whacking with a mallett. I am reviewing my knifemakers guide this week so I can begin working on the blade. Which of my knives is it I'll need to tie down fast around William? I'll bet it's the one in the scabbard with the belt hook. hich of my knives is it I'll need to tie down fast around William? No, that one's safe. You can leave that one out unattended. Bit early but the Mary Rose book has some knives found in and around the wreck, they come in pointy and sheeps foot varietys with some fantastic carved wooded scabbards. Buggered if I can find any images online though. Pete Crossman of Crossman crafts used to have some on his site but I can't find it anymore. Location:Land Locked in the Rockies! Thank you! It was the very first purchase i made when building my kit!